Businessweek.com recently wrote an article, "The Lost Generation", highlighting how the current job crisis is hitting young people especially hard—damaging both their future and the economy. The jobs picture is bleak for those currently graduating from college. Nevertheless, I don't believe that we have to settle for any generation being "lost". However, I do believe that this new economic normal requires a new way of thinking about employment and careers. One of the things that needs to happen is repositioning our youth and young adults to think more entrepreneurially. Equipping people to operate in their careers more entrepreneurially is one of the things that I am very passionate about. That's why I am partnering with Top Flight Resources to provide the Fly High Business Seminar on November 7th. This powerful learning opportunity is designed to equip ambitious individuals to think more entrepreneurially and to provide the necessary knowledge to launch a business. This workshop will provide inspiration, information, and instruction on how to successfully develop and deploy a profitable business venture. For more information please contact Dru Martin (404) 808-6662. My company, Biznovations, is partnering with Top Flight Resources and Extraordinary Life Community Church to offer the Fly High Business Seminar on Saturday, November 7th. This will be a power-packed seminar with dynamic inspiration, information, and insights related to your personal, professional, and business development. Whenever there is a new government spending initiative, I'm always curious to know how small businesses will be included. GovernmentExecutive.com has a blog post that provides somewhat of a status update for how the federal stimulus dollars are being spent (click here). It's encouraging to know that $1 out of every $4 that has been spent by federal agencies so far has been spent with small businesses. However, there is still much work to be done with multiple large agencies coming up short of their goals. "... small disadvantaged businesses have received 11 percent of stimulus contracts, exceeding the goal of 5 percent, he said. Meanwhile, firms owned by service-disabled veteran-owned firms and those operating in historically underutilized business zones have received 4 percent and 7 percent of Recovery contracting dollars, respectively. The goal for both categories is 3 percent." 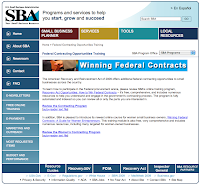 While these are good signs that the government is following through on its promises to intentionally include small businesses in contracting opportunities, pressure needs to be kept on underperforming federal agencies to ensure that all sizes and types of businesses are given an equal opportunity to compete for these contracts. The top reason cited by teens (26%) for wanting to start a business was wanting "to take control of your destiny and set your own career path." Respondents were almost evenly split between feeling there was more job security in owning their own business (47%) versus working for a company (49%). 23% of teens who want to start a business said they were interested in starting a business that "helps the environment" or that "deals with the problems or challenges of our society." Our society's long-term sustainability is greatly dependent upon today's youth being fully equipped to lead effectively when it's time for them to take on the economic challenges that our generation has created for them. Therefore, we all have an active role to play in preparing the next generation to succeed, whether you're a parent, mentor, youth leader, big brother or sister. Let's step up to the plate and develop entrepreneurial leaders who can thrive in any economy. Mistakes Help Make You Great! It's inspiring to hear success stories of entrepreneurs. However, sometimes it's even more beneficial to hear about the major mistakes that entrepreneurs have made and how they overcame them. Check out this article from USAToday.com, "Seven famous founders share money mistake, smart moves", which highlights several business owners who made major money mistakes, but were eventually able to overcome them and continue on to build successful enterprises. Don't be afraid to make mistakes. Just realize that learning from your mistakes can help to make you great! In a report titled, The Economic Future Just Happened, highly respected Kauffman Foundation revealed that more than 50% of Fortune 500 companies were founded during a recession or bear market. 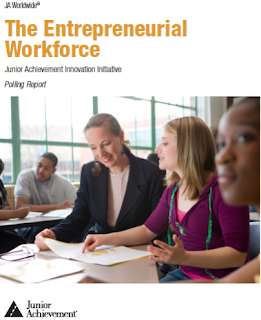 Based on their research they believe there is an entrepreneurial silver lining in today's economy. I agree with them 100%. This is one reason why I am so excited about the Biblical Entrepreneurship Certificate Program. Not only is it an incredible opportunity to learn business best practices for launching and operating a profitable business, you will gain this valuable knowledge from a Biblical and moral perspective. This will help to ensure that a new crop of entrepreneurs don't repeat the same greed-driven mistakes of CEOs and other business leaders that helped lead this economic meltdown. Don't miss this opportunity to be equipped to pursue your passions through a profitable, purpose-driven enterprise! 10% Discount for September Biblical Entrepreneurship Course in Atlanta! Do you have a great business idea and have no idea where to start? Are you a seasoned entrepreneur that needs help with incorporating Christian values into your business? Cost: $400 - 10% discount until 9/6 - use discount code "be1atlanta"
For any small business to grow, it needs to continually extend its reach, enhance its relevance, and expand its relationships. Social networking is a critical tool that will help you do each of these things to build a "community of conversations" with your current and prospective customers. 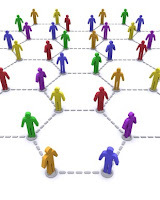 Connections - I can find and virtually "meet" more prospective customers in shorter amounts of time. I have also reconnected with many friends and acquaintances from high school and college who now are also potential customers. Communication - I can build my brand more easily, effectively and inexpensively through the key messages I disseminate to my target market by using these technologies. Also, because they are accessible from my Blackberry, I'm able to do it without being tied down to my laptop. Collaboration - I can brainstorm new ideas in real time with other entrepreneurs and individuals to develop new solutions and business applications. The main social networking platforms I use are Facebook, Twitter, and LinkedIn. I have had a LinkedIn profile for a couple of years, but I didn't fully leverage its capabilities until recently. I just started using Facebook and Twitter earlier this year. These tools have benefited my business tremendously in a short amount of time. Don't underestimate the power of social networks to be potential launching pads for new business opportunities.